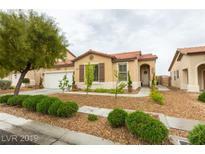 Below you can view all the homes for sale in the Nevada Trails subdivision located in Las Vegas Nevada. Listings in Nevada Trails are updated daily from data we receive from the Las Vegas multiple listing service. To learn more about any of these homes or to receive custom notifications when a new property is listed for sale in Nevada Trails, give us a call at 702-323-5933. This Las Vegas two-story offers an in-ground pool, a den, and a three-car garage. MLS#2090123. Opendoor Brokerage LLC. **HIGHLY UPGRADED**IMMACULATE MOVE IN READY COZY HOME ** 1 story with 3 BR, 2 BA with Den, custom cabinets, plantation shutters, crown molding & 5" baseboards throughout, SS appliances, granite counters with backsplash, real wood floors, Marble floors in Master BDRM, laminate in BDRMS, Brand New Aluminum Kiosk with ceiling fan and wired for a TV, Fully Finished Cement Back Yard with Faux grass, Recently refinished wood trim around entire roof. MLS#2088402. Fathom Realty. Kitchen Has Granite Tops/Tons Of Storage/And High End Appliances! Make This Home Yours Today! MLS#2086369. The Boeckle Group. Freshly Painted, This Is Move In Ready Just Waiting For A New Owner! MLS#2086546. Easy Street Realty Las Vegas. The Kitchen with Table Area Island, Long Bar Counter,SS App,Granite Counters,Extensive Maple Cabinetry, Hardwood Cherry Floors. Polar Shades on All Windows MLS#2086104. RE/MAX CENTRAL. Nevada Trails Stunner* Rare & desirable floor plan centers around interior courtyard w/casita & full bath* 4 bedrooms + den* Gourmet kitchen w/granite counters, stainless appliances, beautiful cabinets, island & butlers pantry* Real wood floors, plush carpet, travertine, shutters, ceiling fans, custom lighting, faucets & fixtures throughout* Huge master bed w/spa like bath* Custom closets* Over-sized lot* EVERYTHING UPGRADED & TOO MUCH TO LIST! MLS#2085048. Coldwell Banker Premier. Kitchen offers granite counters and AMAZING pantry plus stainless appliances*Beautiful backyard features pool/spa/sheer descent waterfalls/gazebo and room to play*Lots of upgrades*MUST SEE! MLS#2084735. BHHS Nevada Properties. 3 bds 2 ba 2 garage* MLS#2084950. Resolution Realty. Beautiful 3 Bedroom 2 Bathroom Home MLS#2084664. Re/Max Titans. Garage has built in cabinets, deep freezer & epoxy floor. MLS#2083841. Keller Williams Southern Nevada. The kitchen is ready for the chef of the house to prep a feast! MLS#2083742. Robinson Realty & Management. Granite Counter Top in Kitchen, Center Island, Large size Master Bedroom, Huge 2nd room open with 3rd bedroom (Combined). Won't be disappointed! MLS#2082746. One Stop Realty. Incredible Open Floor Plan, Tile Flooring In Living Room And New Carpet In Bedrooms, Mbr Is Seperate From Other Rooms, Walk In Closet, Maintenance Free Backyard Made Up Of Synthetic Grass And Concrete With Latice Patio Cover On The Corner. MLS#2078674. Realty Brokers, Inc.
Close to library & freeway. THIS IS A MUST SEE! MLS#2078382. Compass Realty & Management, L.
The backyard oasis is great for entertaining, just waiting for you! MLS#2076084. Home Connect America. Quiet Oversized End of Cul-de-Sac Home in Desirable Gated Nevada Trials-Steps from Gated Jogging/Walking Trail, Park and Child Play Area-Open Floor Plan-Arched Not Squared-Shutters-Granite Kitchen-Upgraded Flooring-Enormous Loft/Game Room/Great Room-Bedroom Down/Guest Quarters-Drive Thru Garage, Great for Workshop-You'll Enjoy your New Life here! MLS#2075585. Realty ONE Group, Inc. Updated Kitchen, Custom Cabinets, New Stainless Steel Appliances, Large Bedrooms, Wet Bar Perfect For Entertaining Newer Pool With Solar Heating. Water Softner, Newer Washer/Dryer. MLS#2074870. Refined Realty. Sparkling Salt Water Pool/Spa, Built In Bbq, 3 Car Garage, At The End Of The Culdesac, Gated. MLS#2074083. Keller Williams Southern Nevada. Upstairs Laundry room. Come check this one out. MLS#2074095. Acclaim Real Estate. Easy access to highway, near by parks, shops and more... MLS#2074900. Ansons Realty. 4 bed, 3 bath home features: Downstairs bed and bath, Extra security features (security gate, flood light, alarm system), and a soft-water loop in the garage. MLS#2074684. Century 21 Gavish Real Estate. Very well taken care of by original owner. MLS#2070868. BHHS Nevada Properties.